The Variegated Plants Group of the HPS was formed during the late 1980s by members of the Society who had a particular interest in growing and collecting these fascinating and eye-catching plants. 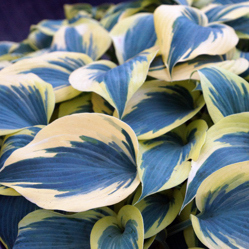 Although an interest in variegated plants may be thought of as specialist, there are many ways these plants can lighten and enhance our gardens and a knowledge of them is useful to all gardeners. We welcome new members from all backgrounds and with all levels of gardening experience. At present, well over 100 HPS members are in the Variegated Plants Group and we are delighted to have a sizeable proportion of these from amongst our overseas membership. There can be few gardens which don’t contain at least some variegated plants, even in the gardens of gardeners who claim not to like them! Membership of the HPS Variegated Plants Group will extend your appreciation of the very wide range of available plants and the effects which can be achieved by using them in the garden. The aims of the group are to make the less common variegated forms more widely available, used and appreciated. Over the years, HPS Variegated Plants Group members have been responsible for the introduction of now well known variegated plants and were instrumental in having the designation “v” added to variegated plants listed in the RHS Plantfinder. Our journal “The Sport” has been published twice a year since 1988. This keeps us up-to-date on recent developments in the world of variegated plants, publishes articles about specific plants and acts as a mouthpiece for members who have views and information to share. Meetings take place at least once a year when a general meeting and garden day are held. In addition, Study Days are held regularly. Many members are keen collectors and propagators so the plant sales and auctions held at our events are opportunities to obtain plants not yet commercially available and which are difficult to obtain elsewhere. Members are always happy to offer cultural advice and also guidance on how to source a particular plant that you may have found elusive. An annual subscription fee is charged for membership of the Variegated Plant Group. The current rate is £4.00 per person. The subscription is due in January each year and payment after October covers membership for the following year as well. Reminders are sent with the Spring newsletter. If you’d like to join the Variegated Plants Group of the HPS, please send your details, together with a cheque made payable to “The Variegated Plant Group of the HPS” to the Treasurer. Please note that membership of the Variegated Plant Group of the HPS is only open to members of the national Hardy Plant Society, for which a further membership charge is payable.